Apple just released the latest Final Cut Pro video editing software to the Mac App Store. Final Cut Pro X is priced at $299. Along with Final Cut Pro 10, Apple has also released Motion 5 – motion graphics creation tool and Compressor 4 – an advanced media encoder. They both cost $49.99 each. If you are used to using apps like Color 1.5 and Compressor 3.5, but Final Cut Pro X brings all those functionality into one app for key sound editing and color grading components to get your entire post-production done in one software. The original Final Cut Pro Suite sold for $1000 so the new Final Cut Pro X with all the features built-in is a steal for $300. If you have been wanting to take your video editing beyond iMovie, what was then available only to professional video editors for a grand is now available at a much more reasonable package of three hundred bucks. 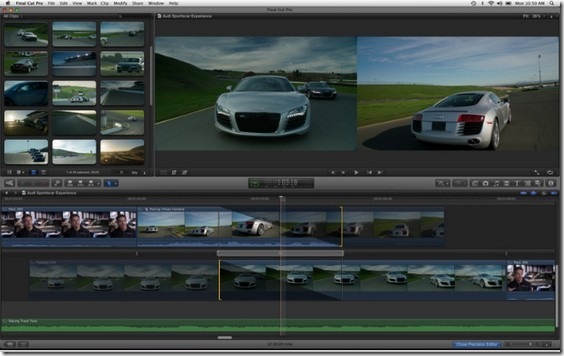 You can check out the new features in Final Cut Pro at Apple’s website. And you can download Final Cut Pro X from the Mac App Store. Also, Mac OS X Lion is going to be available only in the Mac App Store when it comes out in July. But, youcan find out how to create a Mac OS X Lion boot disc here. Check out my Mac OS X apps coverage like Pixelmator here.